"This main course dish is a real beauty! 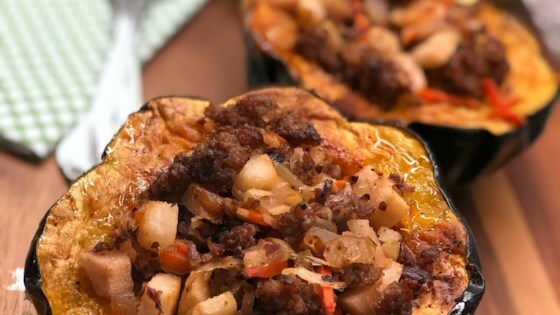 Acorn squash halves are roasted and deliciously filled with a savory sausage and pear saute. The natural sweet flavors from the pear and squash are perfectly coupled with the warm taste of sausage and sage. I've written the recipe for 2 people, but you could easily double or even triple the filling for more squash halves!" Preheat the oven to 400 degrees F (200 degrees C). Line a baking pan with aluminum foil and spray with oil. Rub or brush 1/2 tablespoon oil on the flesh of each acorn squash half. Season with salt and pepper. Place squash halves onto the prepared baking pan, cut-side down. Roast in the preheated oven until softened, about 30 minutes. Meanwhile, brown sausage in a large skillet over medium heat. Add onion, cabbage, and carrots. Saute until onion is soft and translucent, 5 to 7 minutes. Add diced pear and cook until softened but still crunchy, 2 to 3 minutes longer. Remove acorn squash from oven and turn over using tongs. Stuff with sausage-pear mixture. Return to oven and roast for an additional 10 minutes.